We were on a birding trip to Trinidad and Tobago with the Tropical Audubon Society, led by their very capable field trip coordinator, Brian Rapoza. The Asa Wright Nature Centre was our base camp for the Trinidad portion of the trip. On our second day, we returned to camp around sunset, after a full day of birding and met up with a couple of scientists that were part of another group, for a night hike on the grounds of Asa Wright. 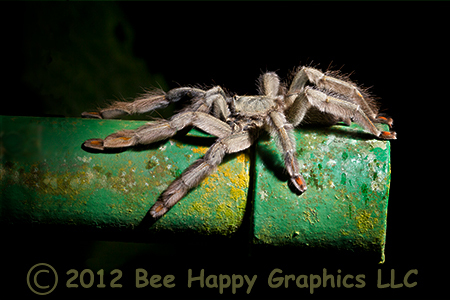 Just before midnight we found this spider, who lived inside the end of this handrail on the trail. Trinidad Chevron Tarantulas (Psalmopoeus cambridgei) are arboreal tarantulas (meaning that unlike most tarantulas, they live above ground) endemic to Trinidad. 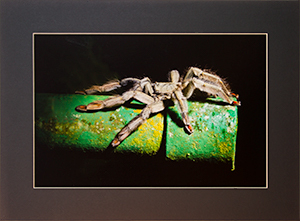 They can have up to a six-inch leg span, and live alone in specially-constructed tube webs or in crevices like this handrail. They are nocturnal and venomous. A bite can send you to the hospital, but the venom may be therapeutic in stroke victims. Females can live up to twelve years. Photographic details: Canon EOS 7D camera w/ EF 100-400mm f/4.5-5.6L IS USM lens set at 260mm. Flash was used. Camera was on f/8 for 1/500 sec at ISO 800. Fine Art Paper 153/4"x101/2" 30" x 20"
Canvas N/A 42" x 28"